Did the Lorentzen's not attend? probably because they live so far away. And memberrs of the Queen's Family. I know her brother died a few years ago but there are probably other relatives. I had to eat dinner. Well, A reporter said that the royals would have a private dinner with the Ferner-family after the service. But the court has now told TV2's royal expert Kjell Arne Totland, that both members of the Ferner-family, the Haraldsen-family and Haakon Lorentzen and his wife (the eldest child of the late Princess Ragnhild & Erling Lorentzen who is 95) will be present at a private black tie dinner at the palace this evening. All of them also attendet the church service. Her oldest brother, Haakon Haraldsen (born in 1920), died in 2016. Her only sister, Gry Haraldsen (born in 1924), committed suicide in 1970. Her second brother, Karl Herman Haraldsen (born in 1929), died in a sailboat explosion in 1936, he was only 7. But the Queen is very close to their children, especially the nephew I wrote about in post 25. NRK1 ended its broadcast 16:30, but are still sending documentaries and summaries of the day. Prime Minister Erna Solberg has thanked Their Majesties (on TV2) for their 50 years of service to the nation, and talked about the King's popularity. Politicians from both side of the spectrum, former prime ministers, commentators (also republicans), have branded the King as the most popular head of state in his own country. Harald Stanghelle (the republican editor and political commentator in the Liberal conservative Newspaper Aftenposten) has said that the King and Queen have saved the Norwegian monarchy. Kjell Arne Totland almost started crying when he saw them in the car. And the almost 90-year-old former prime minister, Kåre Willoch (who I talks about in post 36) was visibly moved. The Norwegian monarchy have been branded as the most popular of them all, and here comes the shook, Haakon is going to be a good King they say (yes, that was a BIG change). BTW, I have never seen a more pro-monarchy media-coverage than I've seen today, republicans have even been called for idiots who want to destroy our democracy, etc. And after I wrote the last post (in about 3 hours ago), The King and Queen and the other royals appeared on the balcony to greet the crowds. Because NRK have filmed people along Carl Johans Gate who literally stood and cried. Well, I'm not the right one to talk, since I teared up in front of the television (what the heck is happening here). And from tonight pictures from the gala dinner! It was lovely to see Princess Astrid at the Church Service and again tonight at the Gala Dinner,did any of her children attend? It looked like a great sequence of events and I hope Harald and Sonja had a lovely time with their children and grandchildren. I do love a good gala where the royals dress up in their finery! Unlike the Behn-girls IA and Magnus luckily do know some protocol and what they owe to their royal grandparents! It's probably already been posted here (forgive me as I've not had time to read through the whole thread) but Martha Louise shared a wonderful photo of the family with Harald and Sonja on her Instagram. The NRF have always seemed like a very warm and relaxed family to me. Yes, the whole Ferner Family attended the dinner. At the Cathedral? No, and that was not a big surprise. At the dinner? We don't know for sure, but TV2 thinks he was present. Thanks to eya & iceflower for posting the official photos! Photographer: Heiko Junge at NTB scanpix. The day-photos: Taken in the white drawing room on the palace's first floor. The evening photos: Taken in the Bernadotte drawing room, also on the palace's first floor (many confuses this room with the red drawing room on the second floor, were the christmas-pictures are usually taken). In the church, the Queen was wearing a new brooch, which she received as a gift of love from the King earlier in the day. 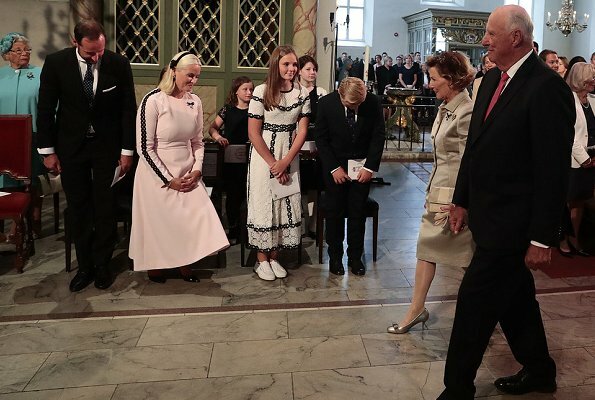 The female members of the Royal Family - Queen Sonja, Princess Astrid, CP Mette-Marit, Princess Ingrid Alexandra, Princess Märtha Louise and her three daughters - were also wearing a kind of needle, designed by the Queen. The Regent Couple had chosen hymns that were sung during their wedding in 1968 and the consecration ceremony in Nidaros Cathedral in 1991. The Bishop of Oslo, Kari Veiteberg, said in her sermon that ''the openness of the Regent Couple’s love has given courage to many''. She also thanked them for comforting the Nation in difficult times, and mentioned the King's widely praised speech from the national memorial ceremony after the acts of terror in Oslo and on Utøya in Oslo Spektrum in 2011. Both the King and Queen was visibly moved during parts of the service. In the evening, NRK sent a pre-recorded interview with the Queen from her childhood home at Maihaugen, where she also talked about the death of her youngest brother (whom I wrote about in post 41). She was visibly moved during parts of the interview. This article contains 3 videos from an exclusive NRK interview, which was recorded a few days ago, and will be sent on television tomorrow evening. NRK's day-coverage: Used their royal reporter, Kristi Marie Skrede & Kåre Willoch (the 89-year-old former prime minister from the Conservative Party, known as a strong monarchist) as experts. NRK's evening-coverage: Used a so-called love-expert & Tor Bomann-Larsen (reliable/serious royal author, known as a VERY STRONG monarchist). The commentators who usually comments on royal celebrations (who's been critical of the CP Couple) were left out. TV2 News Channel's coverage: Used their royal expert, Kjell Arne Totland (an extremely strong monarchist, who just LOVES the royal family). No other commentators were invited. - A FABULOUS DAY! Wednesday became a very busy day for a #royal #reporter - from early morning till late night. But it was great fun & our #King & #Queen really deserve all the #attention, all the #praise & all the #gratitude people showed them on their big day! #GoldenWedding. Yes, they do! - But we don't need to turn into North Korea, do we? Even Marius was praised. ''He is a fine young man in a difficult position they said''. Yes, I almost fell off my chair. The Regent Couple and the court in 2017: We are not going to celebrate! 2018: Opening of the Queen's childhood home, Church Service at Oslo Cathedral, open-car procession, a concert at Oscarshall and hours of TV-coverage. No, we are not celebrating. Plus a balcony appearance and a private black tie dinner. Which means that this ''not to be celebrated event'' actually turned into a pretty large-scale celebration. And it was the third year in a row. Well..Golden Wedding Anniversary is a special anniversary. And us usual Daily Mail is "Daily Fail"-in one caption they wrote that Leah Isadora is CP Mette daughter! Happy anniversary to the couple to many more years. The program of celebrations seemed to maximize openness to the public but remain simpler and more informal than grand gala events in the past. Because making itself beloved to the public has given the Norwegian monarchy a pillar of support, whereas questions of spending have threatened to undermine it, I think it was a careful and correct decision. And to commemorate the anniversary, the Norwegian postal service has issued a new stamp. 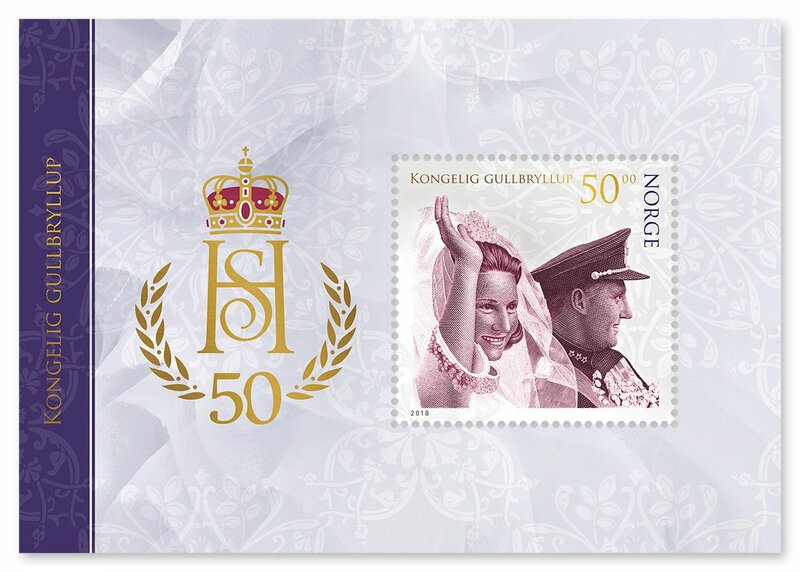 I noticed that the stamp positions Crown Princess Sonja in the foreground instead of Crown Prince Harald, the heir. It seems representative of the view in the media (seeing it from abroad) that the wedding was fundamentally a victory for Sonja, and maybe for royal-commoner marriages by extension. Well, I´ m not sure if this is somewhat of an over-interpretation of yours. As far as I know this picture comes from a real photograph taken on that happy day 50 years ago, other than those fabricated profile-face stamps, often issued at an accession, being made specifically for this certain event. As far as I perceive the norwegian monarchy, there is not so much the concept of "me - the sovereign, my spouse - the substitute", but rather a project, being King and Queen of the country, as a partnership together. 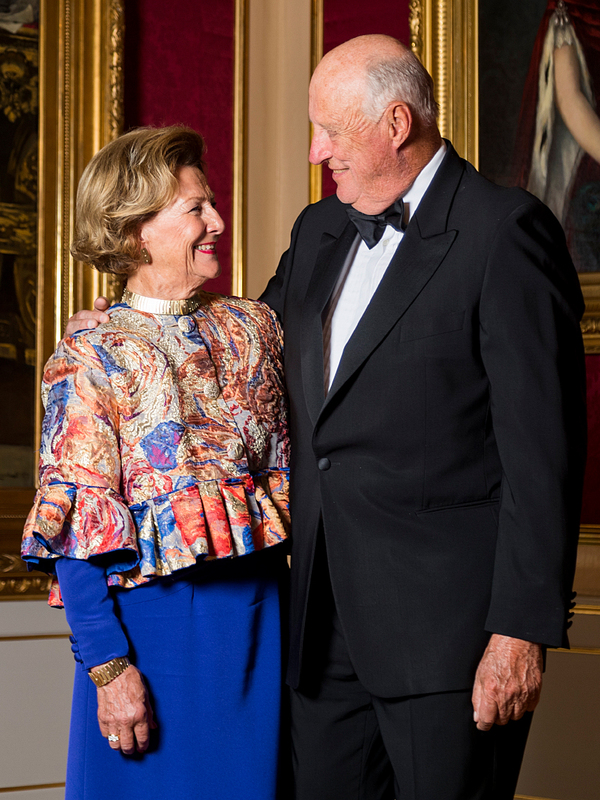 That´s why it was decided 2 years ago that the silver jubilee was not only the King´ s anniversary, but a joint celebration of both Harald and Sonja! Reminds me a bit of how obviously the ex-King of Greece looked upon the "job": In interviews being asked he always says something like "...until 1974, we remained headS of state...", being aware of himself as the sovereign, but also including the Queen as his wife as joint head of state. Some good reflections from you, as usual! 2. The Regent Couple and the court said last year that they weren't planning any public celebrations of the anniversary at all. - Why? Due to the large-scaled and extensive celebrations of the Silver/Consecration Jubilees in 2016 and the 80th Birthdays in 2017. This was criticised by some commentators, and NRK's royal reporter Kristi Marie Skrede said that ''en monark må feire alle sine viktige milepæler offentlig, fordi det er en viktig del av hans/hennes rolle'' (a monarch must celebrate all milestones publicly, because it is an important part of his/her role). On the day itself: Church Service at Oslo Cathedral, open-car procession, balcony appearance and a private black tie dinner. Two days before: Opening of the Queen's childhood home. And a concert with The Staff Band of the Norwegian Armed Forces at Oscarshall Palace today, which is open to the public. But there has still been some whining about the lack of a white tie gala dinner, which made TV2's royal expert Kjell Arne Totland to say ''that we must remember the Regent Couple's age up in all this'' - and reminded us that we had two grand gala events last year for the 80th Birthday Celebrations. And when it comes to foreign guests: Well, that was never going to happen. - Why? 1. QMII and the Swedish Regent Couple were here for the Jubilee in 2016. 2. Royals from all over Europe were here for the 80th Birthdays last year. So, I don't t think it would be quite fair to expect them to get rid of everything and come to Norway in the second or third year in a row just to celebrate the King and Queen. According to the court, the dinner took place in the breathtaking Great Ballroom and not in the Banqueting Hall, where most large dinner are held. The table was set for about 60 people and would have looked a bit like this. Read more about the day here (translation) in this blog post from Kjell Arne Totland, and in this english Royal House article. In other news: The Norwegian artist Nils Bech, who touched many of those present during the church service (including the King) with his song (which he performed together with ballet dancer Silas Henriksen) about ''how it was for him as gay having to hide his ''love for many years'' (a reference also to CP Harald and Sonja Haraldsen's 9 years of struggle to get each other), thanks the Regent Couple for being open and inclusive about LHBT rights. Read about it in this TV2 article (translation), and watch the performance here. And the reason for that (as with most other things who characterize the Norwegian monarchy) is the King's inclusive personality. Although the Queen said last year that she sees her role as being the supporting act of the monarch. And finally, don't you just love those official photos I wrote about in the previous post, and who eya & iceflower posted above? Here is an English Royal House article with all the photos. There are some issues with the translations again, so use your owns. The Nordic RF do these events well with very little fuss and was very nice to see all the extended family included in the celebrations. Significant parts of the concert programme were taken from the corps new recording “Three Kings”, which reproduces music from major events under Norway’s three monarchs after 1905. A CD with the record was handed over to the royal couple during the concert. “As long as military music has existed in organised form, the link to the royal houses in Europe has been strong. Military music has created festivities and ambience by crowns, state visits, openings of national assemblies, weddings and funerals”, said music director at the Armed Forces Music Corps and conductor on the CD, Andreas Hanson. As one can see, the Queen had a plaster on her nose. Why? Because she (according to the court) had removed some pigment spots from her face. So far, 11 million NOK, mostly covered by the state. But it should be mentioned that the second floor isn't don yet, so the total cost will probably reach 15 million.